CobraTrak Plus with Web access is a premium quality stolen vehicle tracking device that offers real time web-based tracking. This means that you can view your vehicle’s location in real time on your laptop, PC or Smartphone via a password protected online application. This is a Thatcham CAT 6 accredited tracker which offers all the security benefits of the CobraTrak Plus, including Tow Away Alert and Tamper Alert. Should your vehicle be moved when not in use or if the battery or wires are disconnected, the system activates. In addition, the CobraTrak Plus with Web access allows geo-fencing alerts to be set up so that your vehicle can enter or leave a defined area without the tracking system being triggered. The system can also be set to a “Transport Mode” to avoid false alerts being set off when the vehicle is being transported via a ferry for example, or whilst being serviced at a garage. CobraTrak Plus with Web works abroad in 36 European countries as well as Russia and South Africa. Facility to view your vehicle’s location online or via your Smartphone via a password protected web-based application. Geo-fence alerts can be set up to allow vehicle movement in and out of a defined area. Transport Mode can be set up by the user to avoid false alerts when the vehicle is transported without being driven by the owner. Pinpoint GPS tracking (accurate to within 10 metres). Supported by both UK and European police – no police hardware needed. Security features include Tow Away Alert, Tamper Alert and GSM Jamming Alert. 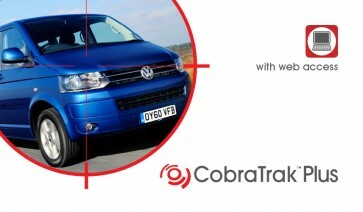 Detailed history in relation to the theft is provided by Cobra to aid recovery of your vehicle. Thatcham 'CAT 6' accredited, sold secure approved and recognised by all major insurers.